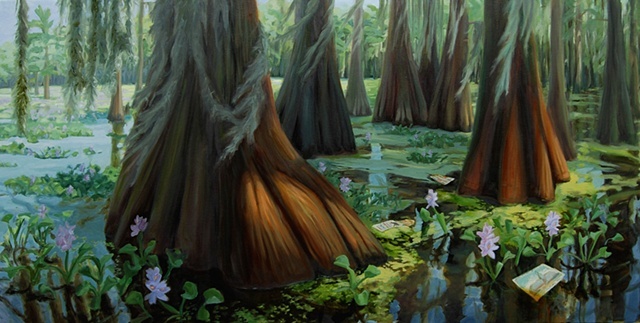 Water hyacinth was first introduced into the United States at the World's Industrial and Cotton Centennial Exposition of 1884-1885 in Louisiana. A Florida visitor to the Exposition apparently returned home with water hyacinth plants and subsequently released them into the St. Johns River. From there it spread rapidly spread to neighboring states. Mats of water hyacinth clog waterways, making boating, fishing and almost all other water activities, impossible; water flow through water hyacinth mats is greatly diminished. The mats also reduce oxgen levels and block sunlight. Growth rates are explosive – vegetative population doubling can occur in 1-3 weeks. Water hyacinths have very attractive purple flowers, and the plant continues to be sold through aquarium supply dealers and over the Internet.